IT WOULD be fair to say that many enthusiasts are familiar with the classic publicity photographs taken at King’s Cross ‘Top Shed’ in 1927 of the then Gresley ‘A1’ No. 4472 Flying Scotsman alongside its comparatively diminutive ‘cousin’ – the Romney, Hythe & Dymchurch Railway’s (RHDR) 15in-gauge No. 7 Typhoon. At the time No. 4472 was just four years old and the three-cylindered Typhoon was new, having made the stop at King’s Cross on its way from Davey Paxman & Co’s Colchester works to the Kent coast. 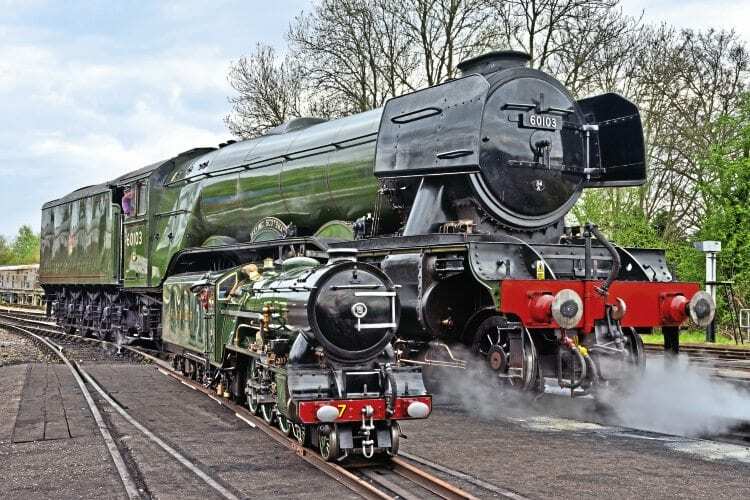 The semi-comic images of the ‘Giant and the Dwarf’, as the contemporary press and newsreels described them, have been seen far and wide in the 90 years since they were taken, but during those nine decades the two Pacifics have never been re-united….until now!